The H910 is enormously fun and the Marshall amps are capable of much more than axe-grinding. UAD's Version 8.4 looks to have something for everyone. For guitarists there is the Marshall Legends Bundle, promising faithful reproductions of the Bluesbreaker 1962 and Silver Jubilee 2555, which are wrapped up with the previously released Plexi Super Lead. For fans of the sound of tape, the Oxide Tape plug-in offers a simple-to-use way into the warm and saturated sonic world of analogue tape. 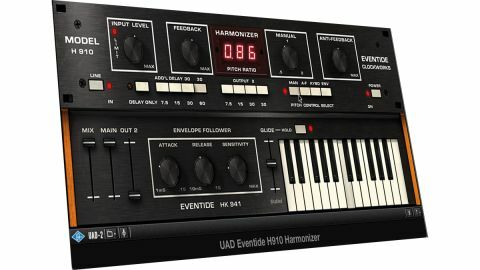 And perhaps most excitingly, UAD reveals a brand new clone of Eventide's H910 Harmonizer, offering everything from sci-fi delays to pitch change and modulation effects. The Eventide H910 was the first commercially available digital audio effects unit, released in the mid-'70s, and it found favour with artists including David Bowie, who found its other-worldly sonic capabilities a perfect match for his artistic endeavours. Its capabilities augment a range of sonic sources, whether you want to thicken guitars and drums, or apply out-there treatments to vocals. The interface starts by offering you an Input gain control, while the next rotary controls the Feedback level of effects, making its presence most keenly felt on the internal Delay unit. The central Harmonizer LED display shows the value of pitch change offset, with 1.00 showing the original pitch. The overall range is +/-1 octave, shown from 2.00 to 0.5 respectively. There are several ways to get the effects unit bending audio to your requirements, the simplest of which is Manual mode, which lets you crank the Manual knob in either direction, with deviations away from 1.00 providing more significant pitch manipulation. Alternatively, you can engage Keyboard mode, which allows you to click notes on the keyboard below, which jump harmonisation settings away from 1.00, which is set at middle C.
By enabling Hold mode, the pitch will stick at whichever note you press (until you select another), while there's also a Glide mode to allow pitches to bend between your selections. Alternatively, you can engage Env(elope) mode, which brings into play the Envelope Follower controls below, letting you set Attack and Release times for pitch variation, with a further Sensitivity dial offered to control the range over which pitch change will occur. "Non-guitarists can add guts/drive to synth parts - the scope for artistic abuse of these amps is huge." If you want to use the H910 as a Delay unit alone, press the Delay Only button, where you can select delay times in multiples of 7.5 milliseconds. By pressing one of the Add'l Delay buttons (to select a specific delay time), the delay units will be summed, to produce an overall delay time of 112.5mS. There is also a second output channel, complete with its own delay, which allows you to create more interesting layered effects - you can use this to blend the original, non-Harmonized signal with the Main outputs processed version, for example. Additionally, sliders allow you to control the Mix balance between dry and wet signals, alongside individual controls for both Main and Out(put) 2 signals. Like the Plexi Lead before it, the two new Marshall amp clones offered in v8.4 have been developed by Softube, with engineering legend Tony Platt (whose work includes collaborations with Iron Maiden, AC/DC and Motorhead) acting as a technical consultant through the development process. The Bluesbreaker 1962 gains its name from Eric Clapton's exclusive use of this amplifier on John Mayall and the Bluesbreakers' self-titled album. It quickly developed a reputation as 'the sound' of Blues music of this time but it shouldn't be pigeon-holed as its sonic capabilities extend much further. Its core tone is brighter and warmer than you'd commonly associate with the Marshall name, though it retains plenty of the trademark crunch too. Both clones here follow a similar modelling path. The main amplifier section, to the left, offers standard controls, including tone-shaping and Presence dials. Flexibility comes on the right-hand side when you enable the Channel Strip option, which expands the GUI of each amplifier to allow you to make microphone choices. The amplifiers vary in this regard, as the microphone options are tailored to each plug-in, but both offer different mic approaches (Dynamic, FET and Valve for the Bluesbreaker; Condenser and Dynamic for the Silver Jubilee) as well as mix faders to set balances between your microphone choices. As a result, the range of tones from each amplifier is phenomenal and non-guitarists will have huge fun adding guts and drive to synth parts, creating parallel distortion channels for drums and plenty more besides; the scope for artistic abuse of these amps is huge. UAD's quality control has always been high and that shows no signs of abating here; all three plug-ins included with the release of v8.4 offer rich sonics and enormous potential for enhancing mixes and productions in a wide variety of musical styles.